… we saw excellent performance of all musicians with a soloist at the head. They gave the best out of them and their rendition was faultless. The chamber group orchestra was yet to play the closing Clarinettino, i.e. Concertino for a clarinet and strings of Ondřej Kukal, and Ludmila Peterková stood out again. 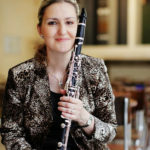 On this showing Ludmila Peterková is the Czech answer to Germany´s Sabine Meyer, a characterful clarinetist, brilliant technically, with a wide range of tonecolours, who sparkles in everything she plays and brings a romantic warmth to such a work as the Bruch Double Concerto. She is consistenly helped by the strong, sympathetic accompaniment of Jiří Bělohlávek and the Prague Philharmonia, here bidding to rival the Czech Philharmonic. Peterková is joined by another brilliant Czech artist, the prize-winning viola-player, Alexander Besa, rich, firm and true, and in the impact of the performance is heightened by the warm, immediate recording. In the two Mendelssohn Concert Pieces the inteplay between Peterková and her accomplished partner, Nicolas Baldeyrou, on the basset horn is a delight throughout, with the instruments blending as well as contrasting. Peterková´s pointing of rhytm with dotted notes exaggerated just enough to give a lift to the music, is masterly both in the two Mendelssohn pieces and in the two sets of Rossini variations. This is fun music, a point clearly brought out by Peterková, with technical problems shrugged aside. In the mazurka passage of the Rossini Variations in C (track 6, 1´52´´) she points the rhytm so charmingly it almost makes you lagh out laud. Dominating the whole, it is Peterková´s brilliant solo art that also concludes the whole delightful piece with the final chromatics. Peterková presents her masterly breathing in the production of pianissimos, while in the contrasting passages she shines above the entire ensemble with her tone. Difficult scale progressions and chord passages are unerringly rhythmically divided, and the orchestra backs it all up with obvious gusto. 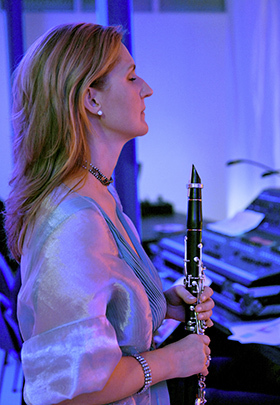 In the public mind it is Sabine Meyer who has the top reputation as female clarinetist, but while she is certainly the most popular, she is definitely not the only woman in the field. Ludmila Peterková is also a name that we must certainly remember after her performance as a soloist in Mozart A major Concerto. She gave a performance of sovereign brilliance in all registers and in her richly colourful mastery of all three movements showed a virtuoso musicianship. She developed her Allegro with self-confidence but absolutely without self-conscious “star” mannerisms, let the second movement emerge in tender elegiac tones, and followed it with a joyfully playful finale. The Prague Symphony Orchestra provided an attentive and reliable accompaniment. Meeting this clarinetist, who has already confirmed her standing with successes in competitions and international concert activities, was definitely one of the high points of the festival. In Wolfgang Amadeus Mozart´s concerto Ludmila Peterková showed herself to be a technically perfect soloist who filled this concerto with life in the richness of nuances and the differentiated range of her intonation. She played vibrantly and intelligently, tenderly and energetically, dancingly – with joyful trills, or sometimes with a softly yearning pianissimo. She gave dynamic shape to the richness of the themes using the greatest possible range of tonal colour. As a soloist, Ludmila Peterková drew on the whole range of her instrument, first in the famous theme of the first movement, and later but above all in the second movement – the melodious Adagio, which came directly to life with the cantabile of the clarinet solo and ended in virtuoso cadences. The tense atmosphere of the Adagio was elegantly dispersed by the orchestra and the soloist in the sparkling rondo of the last movement. Peterková is one of the few wind instrumentalists who manage to go beyond pure instrumental virtuosity and raise their performance into an exceptional experience. In a relatively lengthy piece she presented all the possibilities of clarinet play, and seemed to become one with her instrument in the clarity of her articulation, emphasis on ostinato “obsession” with the theme, and expression of a vivid palette of moods. The audience, which admiringly followed the rich expressive scale of her performance, was clearly fascinated by its authenticity, as was evident from the almost breathless silence in the hall, in which even the practically inaudible of the softest chromatics sounded as effective as the fierce expressive passages.